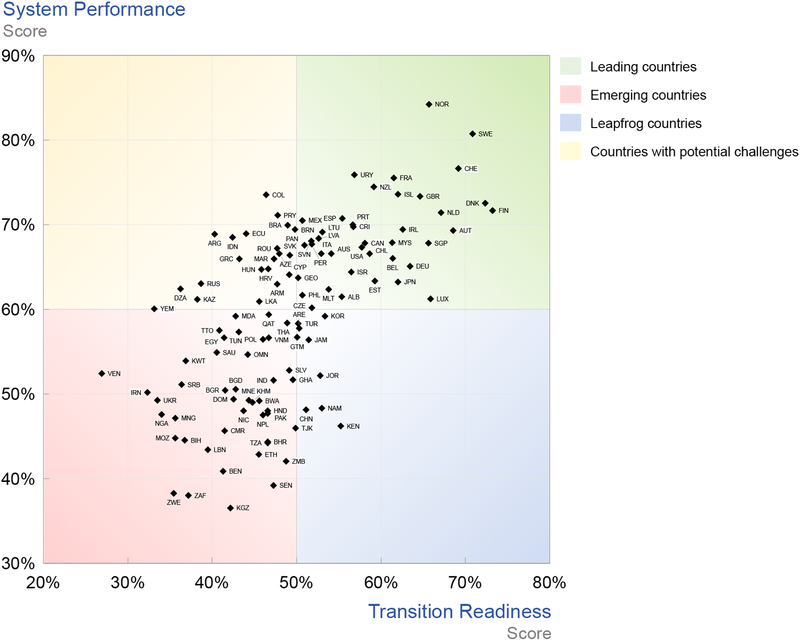 Countries can be categorized based on their relative system performance and transition readiness (Figure 7). When looking into the indicators driving the performance improvement of the top 10 and bottom 10 performing countries between 2013 and 2018, they range across a variety of categories and combinations, providing a sample of different transition pathways. The analysis below shows systemic differences for country categories. 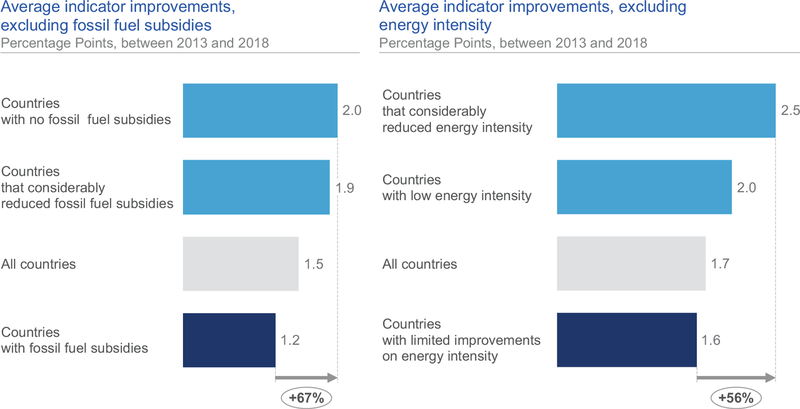 Leading countries were front runners in the advancement of environmental sustainability, with overproportionate improvements in the carbon emissions and energy intensity indicator categories (Figure 10). While their progress in environmental sustainability exceeded the other country categories, improvement in economic development and growth and security and access was lower than the global mean.68 Further improvements have been driven by decreasing energy costs for industry and increasing the quality of electricity supply. In contrast to the other three categories, the removal of fossil fuel subsidies was not a driver of performance improvement for them since these countries did not have significant fossil fuel subsidies in the first place (Figure 8). Regarding their readiness, these countries overcame the challenges from a comparatively high share of legacy energy infrastructure. They could serve as examples to other countries when it comes to policy and regulatory frameworks, infrastructure and business environments needed to incentivize consumer and business behaviour change to manage environmental impact. The availability of new technology, innovative business models, access to capital and general infrastructure particularly exceed other country categories considerably, making this dimension a distinct strength to build on within their transition pathway (Figure 9). Leapfrog countries, which include countries from various geographical backgrounds, seem to have captured opportunities from not having legacy structures, limited locked-in investments and energy systems that are growing. In this context, they supported their energy transition through favourable regulation, attracting capital and improving infrastructure. While more than 80% of countries in the leapfrog category show scores in the top half for regulation and political commitment, only 40% score in the top half on the institutions and governance and human capital dimensions, indicating further improvement areas (Figure 9). Leapfrog countries have similar scores to emerging countries in economic development and growth and environmental sustainability but outperform them in the security and access dimension. However, the progress made by both between 2013 and 2018 was similar due to a larger impact for emerging countries caused by subsidy removal and increased quality of supply. Average readiness scores for emerging countries indicate challenges in almost all areas (except energy system structure), particularly in human capital and regulation. Their results are considerably lower than leapfrog countries and leading countries (Figure 9). A continued reduction of fossil fuel subsidies and improved energy access and quality of supply allowed these countries to start closing the gap to countries with higher performance scores in security and access and, to some extent, economic development and growth (Figure 8). The relative share of countries that decreased their performance is comparable with the leapfrog country category, but twice as high for countries ranking in the top half. 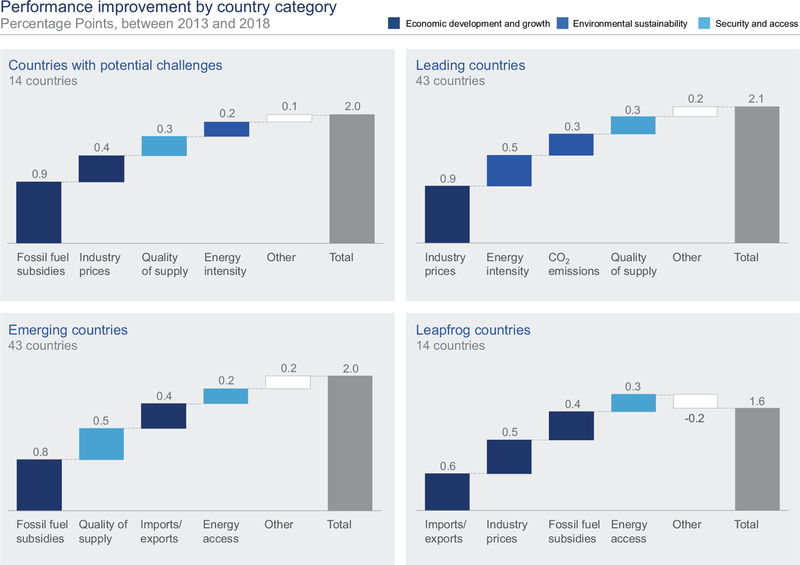 The latter was mainly driven by the environmental sustainability dimension, which indicates a higher risk of performance fallbacks for countries in the two lower performance categories. These countries have relatively well-performing energy systems with high scores in security and access and economic development and growth. Their major challenges lie in environmental sustainability. For the latter, the improvement between 2013 and 2018 underperformed vis-à-vis the other two dimensions. The number of countries with decreasing performance scores within this category was 50% higher than for leading countries, indicating the beneficial impact of increased transition readiness, particularly in environmental sustainability – the dimension with the biggest difference between the two categories. When compared to the leading group, these countries showed greater challenges in readiness in institutions and governance, infrastructure and innovative business environment, and capital and investment. However, when they accelerate their energy transition, these countries will have the advantage of a robust energy system and can learn from leading countries more mature in their energy transition. Although there are different pathways to effective transition, this analysis suggests that improvement in some areas produces more than proportional benefits throughout the whole energy system. Two examples are the removal of fossil fuel subsidies and improvements in energy intensity. Globally, more than $600 billion p.a.80 is allocated to energy subsidies, affecting the fiscal balances and policy behaviours of both energy consumers and producers. The reform or elimination of this type of policy is frequently referred to, particularly in low-price environments, as a win-win course of action that has the potential to positively impact the three corners of the energy triangle: sustainability, economic growth, and security and access. In practice, however, policies to eliminate subsidies face strong opposition from the groups that benefit from them, and experiences with subsidy reform are mixed. In addition to purely economic merits, proper consideration needs to be given to the political economy realities of reforming/eliminating subsidies. Recipients of energy subsidies frequently carry political weight and suppliers usually find that providing subsidies is politically cost-effective. Furthermore, once an energy subsidy is in place, economic and political actors concerned galvanize around it, making reform challenging. 66 Category boundaries are defined by above and below median transition readiness and system performance scores. 67 Several of the countries that are not covered in the analysis due to data constraints are expected to rank in the bottom half of the matrix. 68 Absolute score improvement in security and access is lower than global mean improvement, as the performance in this dimension is already comparatively high. When comparing relative improvement towards the frontier of a 100% score, improvement rates across all country categories are similar. 69 Given the dependence among system performance objectives and limited substitutability across them, using a geometric average rather than an arithmetic average to compute ETI scores would have been the conceptually more attractive choice. However, as differences in rankings are small for most countries, the Energy Transition Index is computed based on an arithmetic average methodology for simplicity reasons. See the methodology appendix for more details. 74 This cannot be explained by the absence of energy-rich countries in the top quartile, as several energy-rich countries with no/limited subsidies manage to rank in the top quartile, e.g. Canada, Australia, Norway. 76 Indicated as an improvement in the energy intensity score by more than 10 percentage points between 2013 and 2017 (>10% score improvement). 77 Indicated as indicator scores of greater than 80%. 78 The average energy intensity score of top half countries was 67% vs 38% for bottom half countries. The improvement rate between 2013 and 2017 was +4.8 percentage points vs +2.8% percentage points. 79 Energy subsidies refer to both subsidies for fossil fuels and for renewable energy.